sport. opinion. discussion. debate. emotion. 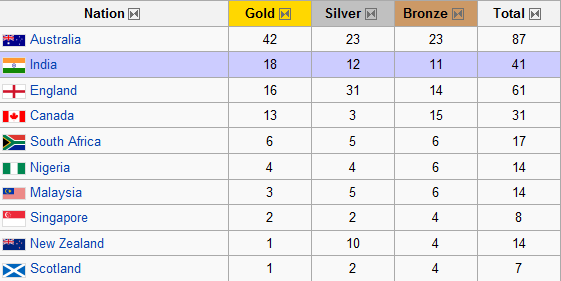 The 2010 Farcical Games held in New Delhi. Delhi Belly, false starts, moths and empty seats… Amongst other things of course. 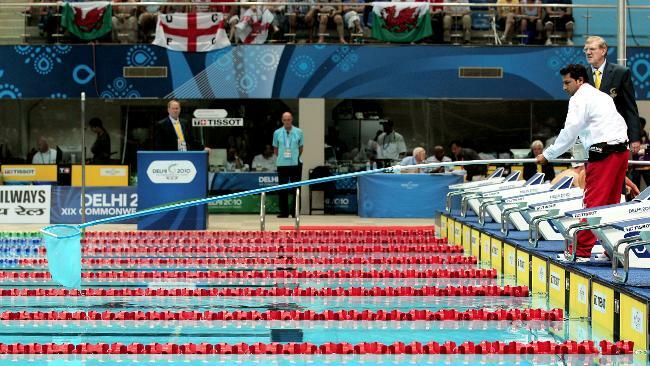 If the lead-up to the 2010 Commonwealth Games was farcical, the actual event isn’t far off. With confusion surrounding the readiness of the facilities, the security for the athletes and officials and of course the outbreak of Dengue Fever, it’s hard to imagine the actual event itself could be worse than the drama leading up to it, however sadly for India, it is. The crowds aren’t showing up as organisers had expected, largely due to the asking price of between 50 and 1000 rupee which takes the typical Indian between 13 and 260 days to earn. In addition to this, Indians simply aren’t interested in sports such as swimming, cycling and athletics, all they care about is hockey, shooting and weightlifting. The presence of moths at both the athletics and swimming facilities has proven disastrous with numerous events being delayed until the bothersome insects vanished. Furthermore, English sprinter Laura Turner claims to have swallowed a moth whilst on the starting blocks waiting to commence the now controversial women’s 100m sprint, which resulted in her false starting. The race itself was also filled with drama after Australia’s Sally Pearson was also found to have false started. Despite both sprinters false-starting, the race was allowed to continue with all runners competing. Pearson went on to win the race and was lead to believe the gold was hers, until a successful protest from both England and Nigeria saw her stripped of the medal. Pearson was reduced to tears, just hours after celebrating one of the biggest moments in her flourishing career. Finally, an outbreak of ‘Delhi Belly’ which has affected a large number of British and Australian athletes has been blamed on the water in the pools at Dr S.P. Mukerjhee Aquatics Centre. Three Australians have come down with gastroenteritis, including Andrew Lauterstein and Hayden Stoeckel who pulled out of their events on Thursday, while at least ten other swimmers have also been afflicted with a milder form of ‘Delhi Belly’. English swimmers Fran Halsall and Rebecca Adlington have also been brought down by upset stomachs but have still been able to compete. British media report up to 40 of their teammates have also been hit. There were fears leading into the event that the reputation of the once famous Commonwealth Games could be permanently tarnished and the future of the games placed in jeopardy. Not even halfway through and the future is looking bleak. Cricket’s at the Commonwealth Games? The Commonwealth Games have begun in Delhi, in fact we are into the fourth day of competition! As usual at the Commonwealth Games, Australia is dominating and again as usual it is all happening at the pool and the velodrome. But does anyone in India actually know that the Games are on? The lead up to these games have been marred with problems and delays etc. and now there are problems happening during the Games as well, the main one is crowd attendances. On the first day of the Games the shooting took place and there was nobody there to watch it. 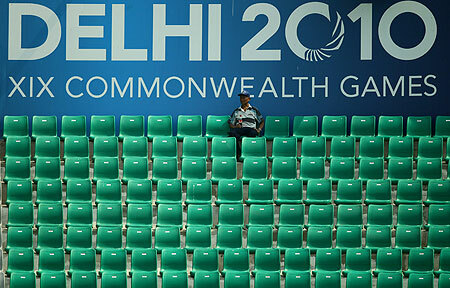 That’s right, not a single person was sitting in the stands to watch representatives from Commonwealth countries participate in an international sporting event. The next highly visible low crowd was seen, sorry not seen, at an Australian netball game, where the Australian score actually outnumbered the amount of people sitting in the stands. A netball game, where teams generally score around 45-65 goals and there weren’t even that many people in the crowd. To watch Australia no less, the number one team in the world at the sport of netball! So have the Commonwealth Games become so worthless, so pointless, that noone from the host nation will not a) go and watch their countries sportsmen compete against the Commonwealths best or b) watch the Commonwealths best. India isn’t even doing that badly, in fact, they are doing much better than I would have predicted for them. Here I was thinking they would only win medals in the field hockey and shooting, however as I write this they are sitting second on the medal tally with 14 gold, 11 silver and 8 bronze, totalling 33 medals. Too be honest, for a country not known as all-round sportsmen/women that is a fairly good return. So obviously it isn’t the performances at the Games by the host nation, what about the other nations? Let me put it simply, the answer to that is no! There have been countless Commonwealth Games records broken so far in the pool and at the velodrome in the four days of competition, that shows that performance levels are high. What does that leave then as the problem? Advertising in the host nation? Ticket prices? Accessibility due to security measures? In my eyes it ia the second of those, ticket prices. Above is a quick table that shows the prices of tickets to the opening and closing ceremonies and the various sporting events. Now while $50 doesn’t seem all that much to us folk here in Australia, it is a hell of alot over in India. The average yearly wage for a person in India is $1,740, or $145 per month. Using a 30 day month, that works out to approximately $4.33 per day. So one ticket to a sporting event, for an everyday person in India will cost them 13 days worth of salary. That is the main reason why the stadiums are empty! How do the planning committee for the Games remedy this then? Simple, they open the games up for the Indian general public. Allow people to simply enter the arenas. There is no point the athletes being over there, showing their skills on an international stage if noone is in the stands to support them and make some noise. At one point during an interview in the swimming complex you could hear two things you should never be able to hear at an international event. First is the sound of crickets chirping, literally. Second is the echo of the interviewer asking his question because there is no other sound in the complex. Get it right India, get some people to the Games so that there is some atmosphere, some form of excitement. Sitting here now watching the hockey (Australia v India) and there is finally some semblance of a crowd at the field. There is noise being made and due to that it is far more interesting than watching one of the other hockey matches where the crowd was like this… Empty! So far these are the worst Commonwealth Games in recent memory, my memory anyway. Bring the games back to Melbourne, we know how to hold a sporting event! In fact, bring the international events to Australia in general, we know how to get everyone involved and enjoying themselves! Fix it India, and quick! 'Like' us on Facebook to show your support! Reeza Hendricks – Remember the name! Zimbabwe return with pride, courage and… A win!